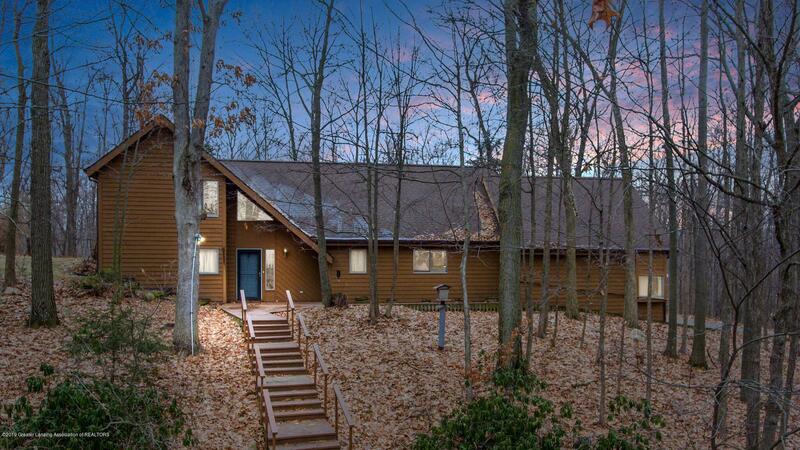 This 3 bedroom, 2.5 bath home is a natural beauty cradled in the woods yet minutes from Williamston. Truly, the best of both worlds! This wood siding 1.5 story home blends perfectly into the surroundings with an attached 2 car garage.The kitchen was designed for people with a passion for cooking. You'll love the pull out cupboards, 2 ovens, 6 burner gas cooktop, and large pantry. A half bath is between the kitchen & the foyer. The great room makes it easy to entertain. Enjoy the warmth and ambiance of the gas fireplace with mantel and hearth. A spacious first floor master bedroom with dual walk-in closets and full bath with double sink vanity. Enjoy the convenience of a first floor laundry area.